Stretch time with Freeze - With the ability to create ambient textures and pads via the Freeze function, Symphony is not your average reverb plug-in. Freeze captures a moment of reverb in time and extends it indefinitely, making it a great tool for creating drones and textural effects. Overdrive and Compression modules via Warp - Symphony comes with Warp tools to bring out specific resonances in your music’s reflections and maximize the overall reverb signal. 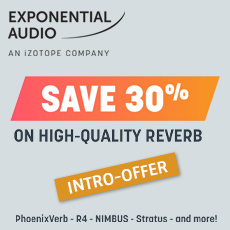 When used in conjunction with Reverb Freeze, you can create nearly limitless original spatial effects for your music. Expanded controls for creative precision - Tail Suppression and Recovery ensure that Symphony’s reflections won’t overcrowd your mix or obscure any original audio. Use the Balance module for channel-specific delay and level controls to decide when and where your audience hears the reverb in your mix.